In this local tulip fields guide you will discover the best trips to tulip fields from Amsterdam, when tulip season in Noord- Holland and The Netherlands is, the best place to see tulip fields in Holland, best tulip fields tips by a local and where to find the best tulip fields in Holland. Do you want answers to where you can find tulip fields in Noord- Holland, The Netherlands, without tourists? Here you will find the perfect cycling tulip route of The Netherlands in 2019. Here you will discover where to find tulip fields in the top of (kop van) Noord (North) – Holland, The Netherlands. Including a tulip route for The Netherlands in 2019. You will also get to know the best place and best time to see tulip fields in Holland. It also includes tips for day trips from Amsterdam to tulip fields and flower fields near Amsterdam. You will find the locations and areas in the province of Noord-Holland, The Netherlands where you can see and find the tulip fields like a local. If you want to discover tulip fields in The Netherlands off the beaten path, then this is your place to be. It’s that time of the year again. Tulip season 2019 has reached The Netherlands, and what best way to see the tulips then with the tips of a local resident. I, as a local, will tell you where the tulip fields are located in Noord-Holland, The Netherlands and how to get here. The surroundings of Lisse and Hillegom are named the bollenstreek area and is most popular with foreign visitors. Most tulip fields aren’t in the bollenstreek in Zuid-Holland. Nowadays the best place to see the tulips in The Netherlands is where I’m from and still live. We call it ‘De Kop van Noord-Holland’, literal translation, the head of North Holland. So, if you’re looking for the best places to see tulips in Amsterdam, I have to disappoint you. You won’t find any tulip fields in Amsterdam or in that part of The Netherlands for that matter. You can find tulip fields in Noord-Holland everywhere. From the small city named Petten to Nieuwe Niedorp. And from Alkmaar till the marine city of Den Helder, this part of The Netherlands is one big tulip field. The horizon is breath-taking. No flats, other huge buildings or highways. Instead, there are dunes, windmills, typical Noord Holland style houses, and rivers. If that doesn’t sound like your place to go to, then I would suggest you to not even start traveling to The Netherlands. Kidding, we love your money. Please come. Here you will see the tulip fields in The Netherlands off the beaten path. So, because the tulip area used to be in Zuid- Holland (South- Holland) most people will visit De Keukenhof and surrounding areas. But let me tell you a little secret here. Be a little more adventurous and catch a train to Schagen, Anna Paulowna or Den Helder. It is an hour by train from Amsterdam to Schagen and in the province Noord- Holland (North- Holland). But definitely worth the adventure. And worth all the beautiful photos of the tulips you will take here. Here you will find endless tulip fields and no people. So this is definitely the best tulip adventure in The Netherlands with tips from a local. If you want to stay a little bit longer in the area of Schagen, it is easy to book a hotel here if you book in advance. The area is quite popular with German people and we don’t have that many hotels. I would book a hotel, bed & breakfast or hostel in Alkmaar, Den Helder or Schagen and from there travel through this area of The Netherlands. With this information, you will see the tulip fields of Noord-Holland, The Netherlands like the locals do. Tulip fields in The Netherlands without tourists. Doesn’t that sound appealing? Exactly. Keep on reading to experience tulip season in The Netherlands like a local. When is tulip season 2019 and when do tulips bloom in The Netherlands and Holland? Tulip season 2019 in The Netherlands, Amsterdam and Holland is headed our way. In general tulip, or flower, season in Amsterdam and The Netherlands is between mid-April and the beginning of the first week of May. Only three weeks. Keep in mind that there are no exact days, as it’s natural. When we have a severe winter, the tulips are two weeks later. Yet, when the winter is mild, the tulip season in The Netherlands starts earlier. But the end of April is the absolute best time to visit The Netherlands and Holland for tulips. So when is tulip season, or how some like to call it tulip time, in Amsterdam, The Netherlands, and when can you see tulips in Amsterdam? The best time to visit Amsterdam for tulips and tulip fields close to Amsterdam is the end of April. If you’re looking for tulips or tulip fields in May or June near Amsterdam then you will be disappointed. The flowers are cut of the tulip fields at last the end of the first week of May. Don’t be stubborn and think they will still be there. The flowers don’t wait. So off they go. Are there tulip fields or flower fields in Amsterdam? There are no tulip fields or flower fields in Amsterdam. So if you’re looking for the best time to see tulips in Amsterdam or where to see tulips in Amsterdam, then you’re in for a disappointment. During the tulip season in The Netherlands you will find tulips spread throughout Amsterdam, however for the real tulip fields you have to be somewhere else in The Netherlands. There are many trips you can take from Amsterdam to bulb fields and the ones listed below can be easily done as day trips from Amsterdam so you can see the tulips. So where can you see tulips near Amsterdam and which places are the best for bulb or tulip field trips from Amsterdam? Don’t walk through tulip fields! What? I cannot take photos in tulip fields in The Netherlands? No. Unless a farmer gives you permission. 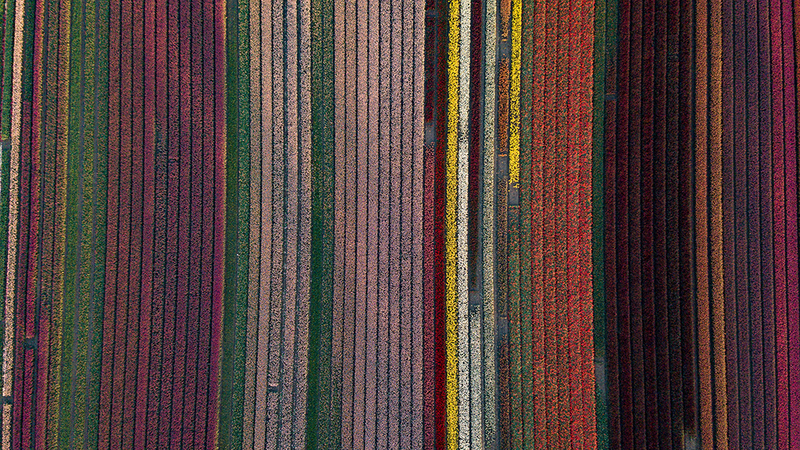 These tulip fields aren’t here for your Instagram page. They are here because it’s the work and thus food of the farmer and his or her family. If you walk through the tulip fields, sit in the tulip fields or even lay down in the tulip fields, you can easily damage or completely destroy a lot of tulip bulbs. This means that the farmer gets no money for that part of the field. Or he or she needs to throw it away or even gets a disease in the tulip bulbs in half of the fields. Where can I find and see local tulip fields without tourists in Noord- Holland, The Netherlands? Take the train towards Den Helder. 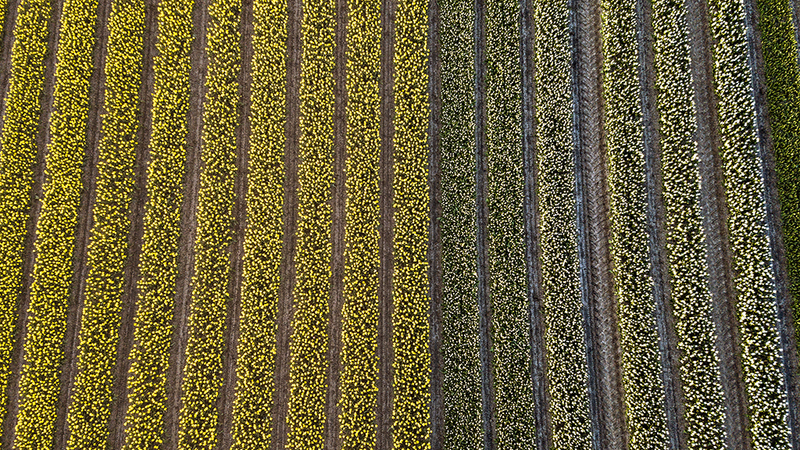 It’s easy to reach a small city that is surrounded by Dutch bulb fields by train. During rush hour there runs another train and the final destination there is Schagen which is also fine. Get out at Schagen station. On your way towards the city Schagen, you will already see the beautiful and endless tulip fields. Keep in mind that the specific location of the tulip fields varies every year. It’s not healthy for the soil and for the crops to keep the same produce longer so the farmers will change up the crops to ‘feed’ the soil. So where the tulips in Noord (North)- Holland are depends every year. But when the tulip season of 2019 in Noord (North)- Holland arrives it’s always great to take a train from Amsterdam up North to do a tulip fields tour. This is one of the best places to see tulip fields in The Netherlands. For bicycle hiring in Schagen, there’s Fred’s verhuur. Sent him an email and be there on time to pick up your bike. Fred’s verhuur is located at de Fok 10, 1742 PD Schagen and opens from 9:00 – 18:00. Email: info@fredsverhuur.nl, www.fredsverhuur.nl and the telephone numbers are the following; mobile: +31-621647341, normal phone +31- 224299874. If you managed to get a bike, you’re ready to move. Make sure to have Google Maps or Maps.me on your phone, or ask around, we will all be happy to help if you ask us nicely. Of course, you can also explore this region of The Netherlands with the highest density of tulip fields by car. You will be everywhere way quicker but can also take your time. But, it can be tricky to park your car quite sometimes, and the smell of the countryside is something you shouldn’t miss. So, open the window of your car to smell the fresh grass, tulips, and cows. Unless you have hay fever. In that case, take your meds and good luck. The views are worth it. And you’ll be seeing tulip fields without tourists, like the locals in this part of The Netherlands. You would need to put the car on the side of the road in the grass, however, if it has rained before it can be really difficult to get out of the grass. Cycle towards Dirkshorn via the cycle path next to the n241. Usually, you’ll see tulips here already. So, proceed cycling straight forward towards de Middenweg. In the beginning of this road (either before or after the train rails) you will see the tulips too. (Note: the beginning of the road is for Dutch people a km or two cycling, not 20 meters). Then head back and continue going towards Nieuwe Niedorp. It will be a quite long ride, but definitely not too bad. If you see some fields a bit off these places, don’t be afraid to go there as well. Up next you will pass a village called Zijdewind. It’s small, cute and there’s a river running through the village. It is a common village in the countryside of The Netherlands. That’s all you need to know. Now you have two options. Either you continue cycling to De Weel and have a little picnic at the lake, or you cycle straight towards the village ‘t Veld. The village ‘t Veld has a bakery named Beemsterboer, a butcher named Broersen and a small supermarket called Superrr. If you would like to buy some stuff for a picnic or lunch break during your cycling tour, these are your best bets in this area. You would have to get a little bit into the village for these stores and go back again towards the Leijerpolderweg. But remember, these shops are in a small village, so none of them are open on a Sunday or after 17:00- 18:00. As you continue cycling you will see more and more tulip fields in Noord-Holland coming your way. As a local, I know my way around the tulip fields in Noord-Holland. All the way around the route I told you about, there are plenty of fields. Like I mentioned before, don’t hesitate to go off this route if you see other tulip fields, flowers or great scenery. All the way until Nieuwe Niedorp and back via both routes, you will be surprised by the beauty of the scenery. When I’m talking about Snevert and Nes in Schagen, these are both streets, like you noticed, but they have great tulip fields around. This is one of my favourite routes and tulip fields tour that you can do as a day trip from Amsterdam. You won’t enter the village of Dirkshorn, so if you need to pee then I would suggest you keep it in for a little longer. After Dirkshorn you will pass a village, called, Zijdewind. You can use the toilet at the camping that they have here. If you’re exhausted because you cycled around 7 km, then you can have a break at Camping De Rietkraag for a drink and apple-pie as well or ice-cream. In Nieuwe Niedorp there are several places where you can have a seat and bite as well. For instance, Restaurant De Rijd, but also small cafes as Mauritsbar and Café Beentjes and places for a snack. There is a big supermarket called Jumbo and plenty of other stores. John Bes is the place for fresh fruits and veggies. On the way back, you are able to pass the village Barsingerhorn. Here you can find Café De Fortuin which can be a great place for you to take a small break. And that’s it. You will be back in Schagen before you know it. You could either rent a hotel room in one of the hotels in Schagen. Don’t forget to grab a bite at De Markt. Here are all the restaurants and cafes located or head back to where you’re staying. But I would definitely suggest you stay a little and explore one of my favourite areas of The Netherlands. Stay in Schagen, Den Helder, Anna Paulowna, Alkmaar or one of the smaller places. This way it’s easier to find the tulip fields and you won’t need to travel back to Amsterdam for an hour or an hour and a half. Don’t forget to get some ice-cream at Picobello in Schagen. You can thank me later. 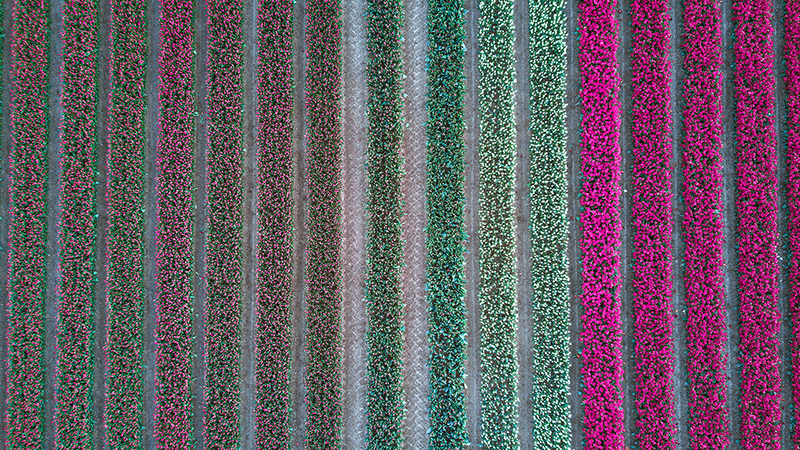 A beautiful aerial view of tulips in a tulip field near Amsterdam in Noord- Holland. Schagen- Schagerbrug- – Sint Maartensbrug (Ruigeweg) – Sint Maartensvlotbrug- Belkmerweg (street name) – De Stolpen- Bosweg, ‘t Zand – Oudesluis – Schagerbrug – Schagen. Route 2 is perfectly suitable for beginners. This will be cycling around tulip fields in Noord-Holland for around two hours, however, you can always go back earlier. This route is absolutely beautiful, and you will be surprised how many tulip fields you will be discovering. Absolutely mind-blowing. And definitely one of the best places to see tulips in Noord-Holland. I’m going, to be honest here with you, you will need to rent the bike for two days for route 2. Or you have to cycle at full speed and be close to dead at the end of this ride. You definitely want to explore the surroundings best, and if you have more time to get around then I suggest you take this route. With this cycling route will not only see tulip fields in Noord (North) Holland but also dunes, windmills and plenty of more. The true The Netherlands is rising. And when you’re in Alkmaar anyway, have a look at this itinerary to spending one day in Alkmaar. With route 3, you leave from the bike rental and go straight towards the village ‘t Zand. All the places you will pass on this route will have you thinking, ‘People actually live here. This is so cool.’ At least, that’s what my foreign friends said, so I kind of think that they are right, as they are a great bunch of people. The villages look like they stepped out of a fairy-tale. During all of the routes, you will see a different and local part of The Netherlands, and you will love it. Definitely sent me some photos and your stories about how it all went down. If you have time on the second day, then I suggest you take a small walk through the forest and dunes of Schoorl (your first stop). It will be so worth it. Schoorl is one of the most beautiful places in our country, in my opinion. As you’re passing Schagerbrug you have several options for a tiny break. But I would suggest you go to Brasserie De Keuken. In Petten, there are several places, as Brasserie Restaurant Zo Gewoon and Zee en Zo. At Strandpaviljoen Hargen in Hargen aan Zee, you will have a place for you to relax and have a look at the beautiful beach. Around Egmond aan Zee there are plenty of places for you to relax after you finished yet another part of the bike ride. Restaurant Van Speijk, Natuurlijk, Zilte Zoen Egmond aan Zee, D’ Oude Clipper, and Strandpaviljoen de Schelp are all located there. But really, there are so much more places where you can relax, so don’t stress if you find a restaurant that is not on the list. In Egmond Binnen, I suggest you go to Gaterij Nieuw Westert or Het Wapen van Egmond Binnen. At Castricum aan Zee there are several places where you can relax, as Deining aan Zee and Strandpaviljoen Zoomers (this one is located on the beach). In Heiloo you can take a seat at Melange7 or Restaurant Herberg Jan before you continue cycling towards your destination for today, which is Alkmaar. There are plenty of hotels in Alkmaar, but also in villages around the city. So, don’t hesitate to go to another city for a hotel or bed and breakfast. In Alkmaar, I would suggest you walk around Paardenmarkt, Waagplein, and Houttil as there are plenty of places to sit and eat around there. I have too many favourites so then this list will become endless. Then, the second day you’re heading to Schoorl first. In Schoorl I definitely would say go to Restaurant ‘t Trefpunt. The people are lovely, and the location is to die for. De Klimduin is located right in front of you. For the people who do not know what this is, just google it. This right here is my childhood. On the way back, you are able to pass the village Barsingerhorn, where Café De Fortuin is a good place for you to take a small break and release your pee. On the second day, you will be back in Schagen before you know it, with sore legs and grab a bite at De Markt where all the restaurants and cafes are located. Or head back straight away to where you’re staying. But I would definitely suggest you stay a little. Don’t forget to get some ice-cream at Picobello. You can thank me later. Don’t forget to bring back the bike. When it comes to renting bicycles in Anna Paulowna and its surroundings I would suggest you rent a bike at Kooij Tweewielers. Be on time with your reservation for the bike as it’ll be busy. You can either call for a reservation to +31 223533320 or send an email to info@kooij-tweewielers.nl. They are located at Cornelis Keijzerlaan 2, 1761 CH Anna Paulowna. You won’t get bored when you ride a bike around here. If you fancy a bite or need to go to the toilet, head to the café called ‘t Ouwe Veer (the old feather) and you’ll feel relieved in no time. If you have a lower budget, then I suggest you head to one of the plenty supermarkets they have there. When it comes to finding tulip fields in Anna Paulowna, it’s very easy. First you can cycle all around the neighbourhoods. Then explore the village and head towards Julianadorp or Callantsoog. Both towns are known for their nature and tulip fields. Especially Callantsoog, which is located at the sea and includes a nature reserve, called Het Zwanenwater. Het Zwanenwater has the biggest natural dune lakes of Europe and is truly breath-taking to walk through. You will see plenty of tulip fields around Callantsoog. And again, just cycle towards a place you think is great, and if you’re lost we will be able to help you. 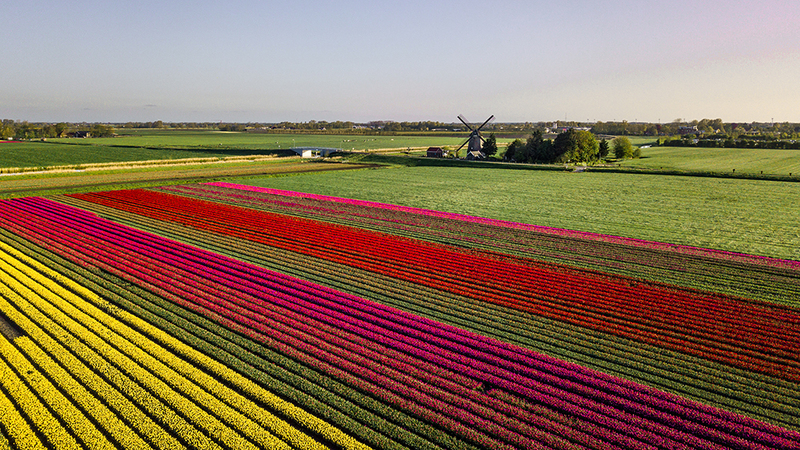 This is one of the best ways to explore The Netherlands during tulip season. So, if you’re planning on cycling throughout the villages even further North in De Kop van Noord- Holland I suggest you go to the following cities/villages. Anna Paulowna – Julianadorp -Groote Keeten – Callantsoog – Petten – ‘t Zand – Anna Paulowna. In this case, you will definitely be occupied in the surroundings of Anna Paulowna in Noord- Holland for at least half a day because then you have enough time to enjoy the tulips, other flowers, and scenery. In most villages, there is a supermarket, and there are restaurants and cafes. Especially around Groote Keeten (search for Brekers or De Princen Keet) and Callantsoog (Grand Café De Foyer, Woest, Ijsie Prima (ice-cream)) where they are mostly located and on the beaches. But if I was going to write all of them down in this post it will truly never end. Also, not all supermarkets are open on a Sunday, so in case you’re heading here on a Sunday check their opening hours and bring some of your own food. If you decide to head towards the station of Anna Paulowna, don’t forget the endless amount of activities they have in and around this village during April. The dates differ every year, but it always comes back. The first thing you shouldn’t miss is De Bloemendagen (the flower days) in Anna Paulowna. There are tons of flower mosaics; plenty of streets and bridges are decorated with flowers. For cyclists and pedestrians, there are special routes that you can look up at their website here. It lasts from around the 29th of April until the 3rd of May. Don’t forget to bring yourself a visit to the Poldertuin, which is located at de Molenvaart (it’s a street name). This is a garden where you’ll find all the crops that are growing in the surroundings. Next up you have Bloeiend Zijpe. Bloeien Zijpe is the most important event for flowers and tulips in the surroundings of the top of/ kop van Noord- Holland. The main goal is to make sure everyone enjoys the beauty and endless colours of the flowers. There are plenty of activities, but there are two things you shouldn’t miss out on. The cycling route throughout the tulip fields, which is around 23rd of April. And the walking route, that is around 30th of April. Check their website for the real dates, as this changes every year depending on the growth of the tulips. 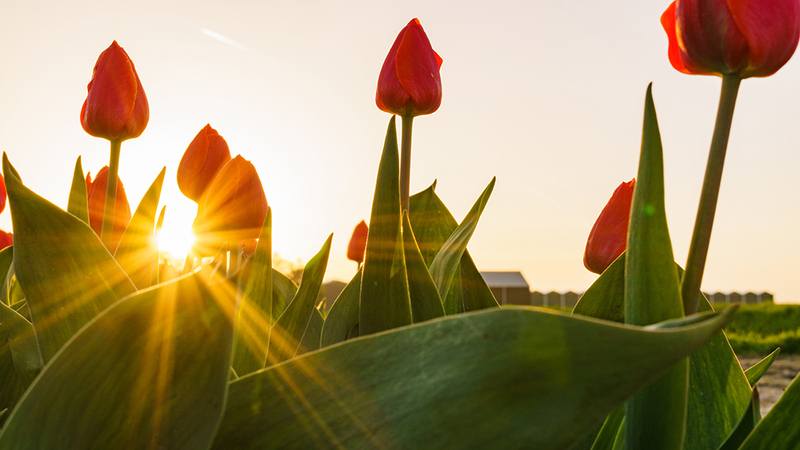 These activities are some of the best things to do during the tulip season in The Netherlands. Please notice that walking through the fields is a great experience but also more difficult. You won’t walk between the tulip fields. But on the land of the farmer, where no tulips are. If you are not able to walk a lot or at the rough ground, biking or taking the busses would be a better option. Click here for their website for more information. Like I mentioned before, there are other things to do there as well. Because of that Bloeiend Zijpe is interesting and opened between the 7th of April and the 7th of May. Although Bloeiend Zijpe isn’t in Anna Paulowna itself, it’s in the area. The activities take place or start from towns and villages as Callantsoog, Schagerbrug (which is very close to the city of Schagen), Petten, Sint Maartenszee and ‘t Zand. Another thing you shouldn’t miss out on is Fluwels Tulpenland in Sint Maartenszee. It is located in the heart of the tulip fields and is actually a theme park about tulips. The start and finish of the tour are in a typical Dutch ‘stolpboerderij’. This is a typical house in the Dutch countryside. If you want to know more about Fluwels Tulpenland, then I suggest you head over to this website. Last thing, the Floratuin in Julianadorp is also worth a visit. You can take tulips fresh from the fields, so you have a nice bouquet of flowers to take home with you. But, there are more than 1500 different species of flowers there. And not only tulips. So, for the indecisive people under us, good luck. There is also no entrance fee. There is also a place where you can have a drink or bite around here. For more information, click here. Is there anything you’d like to add, or that you’re missing? I hope you enjoyed this article and you get to see tulip fields in Noord-Holland, The Netherlands like a local. I hope you learned when tulips bloom in Amsterdam, whether there is a tulip farm in Amsterdam and when the tulip season in Noord- Holland and The Netherlands of 2019 starts. If you have any questions, comment below and I will be happy to answer them all. I hope you will enjoy Noord- Holland, the tulips and the experience of seeing free tulip fields in The Netherlands the local way. Share this article!! Click here for accommodation tips during tulip season, and click here for all my articles.